Your partner in advanced stroke care Via Christi Comprehensive Stroke Center The impact of timely stroke treatment cannot be overstated. 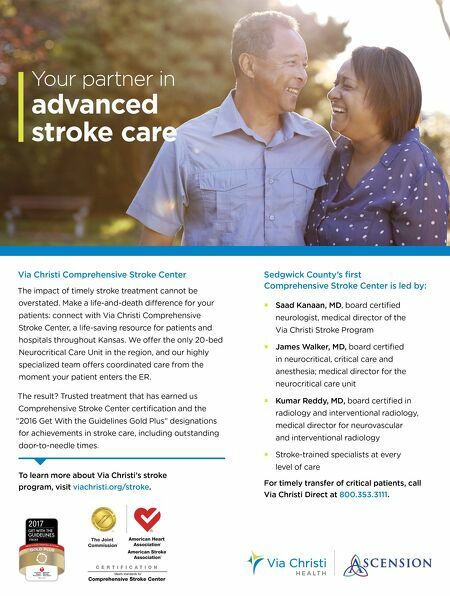 Make a life-and-death dierence for your patients: connect with Via Christi Comprehensive Stroke Center, a life-saving resource for patients and hospitals throughout Kansas. We oer the only 20-bed Neurocritical Care Unit in the region, and our highly specialized team oers coordinated care from the moment your patient enters the ER. The result? Trusted treatment that has earned us Comprehensive Stroke Center certification and the "2016 Get With the Guidelines Gold Plus" designations for achievements in stroke care, including outstanding door-to-needle times. To learn more about Via Christi's stroke program, visit viachristi.org/stroke. 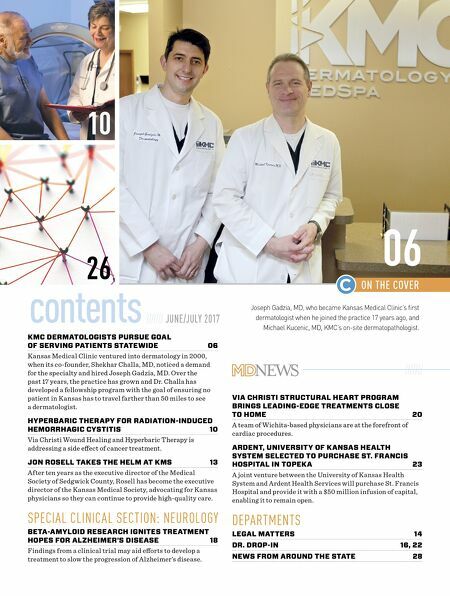 Sedgwick County's first Comprehensive Stroke Center is led by: Saad Kanaan, MD, board certified neurologist, medical director of the Via Christi Stroke Program James Walker, MD, board certified in neurocritical, critical care and anesthesia; medical director for the neurocritical care unit Kumar Reddy, MD, board certified in radiology and interventional radiology, medical director for neurovascular and interventional radiology Stroke-trained specialists at every level of care For timely transfer of critical patients, call Via Christi Direct at 800.353.3111.